Polish pottery coffee mug 10oz. Hand-painted Polish stoneware holds both heat and cold for extended periods and is durable enough for everyday use. 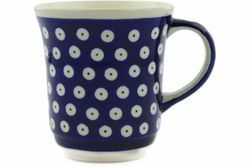 Available in a varieties of patterns, this Polish pottery coffee mug fits comfortably in your hands and is guaranteed to become your favorite.